Even though it is totally nerdy to blog about this, I can’t help myself. I had a real “librarian moment” today at work that made my whole week. This morning my co-worker and I went to one of the elementary schools and booktalked about 20 books for a gifted reading class of 3rd-5th graders. They were such a great audience because these kids truly love to read, but that wasn’t even the best part. 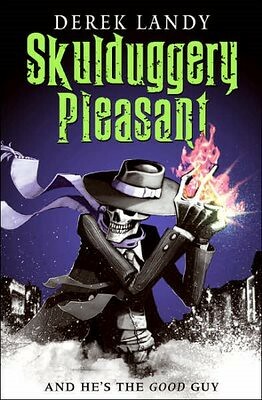 One of the books that I talked about is the amazingly awesome “Skulduggery Pleasant” by the incomparable Derek Landy. I don’t even have to mention how great it is because the cover pretty much says it all. Well, this afternoon while I was sitting at the desk, a boy came up to the desk right at 2:30 (they get out of school early on Wednesdays here which is totally unfair) and asked for this book! He was real shy but his Mom said he had heard the book talks this morning and was really excited about this book! Sorry for the lack of posts from me lately. Believe or not, there really hasn’t been anything in my life exciting enough to blog about (with the exception of the Dolly Parton Tea Party, which was pretty awesome). I also love the fact that I get to buy the DVDs!!!!! Putting me in charge of purchasing the children’s DVDs is like letting a fox into a henhouse………..I have waaaaay too much fun doing it. I had a little bit of extra money because the year is drawing to a close, so I have been buying like crazy. I think it is really healthy for me to get to spend so much money on DVDs at work, because then I don’t feel the need to spend as much of my own money to buy DVDs for me. One of my recent purchases that I am super excited about is the First Season of “The Gummi Bears” on DVD!!!!! You may all be way too young to know what that was, but it was all about these bears that lived in a forest and made this wicked gummi-berry juice that allowed them to jump super high!!!! Okay, now that description is not the best, but if you watch this video, you will get the idea. Now there are lots of other cool things about being a librarian, but I am too tired and lazy to list them all now. P.S. I totally watched “Honey, I Blew Up the Kid” on tv today, and I forgot how awesome that movie is!!!!!!! So much better than the first one (because it made me cry when the ant died), so funny and cute. Awww, it’s one of those movies that you never think about until it is on tv and then you have no choice but to watch it because it is so amazing!